Findings from a newly-released survey indicate that there are specific levers that government and private sector partners can use to influence and increase overall individual and community preparedness. The Federal Emergency Management Agency’s (FEMA) Individual and Community Preparedness Division (ICPD) released the findings from its 2015 National Household Survey of 5,000 Americans in June. The survey is designed to measure household and individual preparedness and awareness. 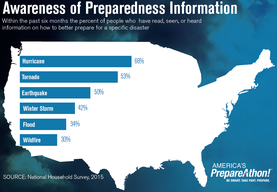 Among the most significant findings, the survey found a positive relationship between awareness of preparedness information and the action of taking steps to prepare for a disaster. The survey also notes a relationship between experience and action, finding that individuals living in areas with a history of a specific hazard and who have experienced the impact of that hazard are significantly more likely to report they had taken basic steps to prepare themselves and their household. When it comes to awareness of preparedness information, 66 percent of Americans living in areas with a history of hurricanes reported that they had read, seen, or heard information on how to better prepare for a hurricane within the past six months, the survey said. Individuals living in areas with a history of tornadoes were the next most aware of the pertinent preparedness information for their relevant hazard with 53 percent of respondents in those areas saying they had read, seen, or heard information on how to prepare for a tornado in the last six months. The survey included a series of oversamples in U.S. counties where specific hazards, including: earthquakes, extreme heat, floods, hurricanes, tornadoes, wildfires, and winter storms, present a risk to those populations. ICPD will be going back into the field later this summer to administer the 2016 National Household Survey. For more information and to review a summary of the 2015 findings, click here.